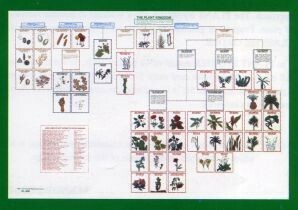 The chart of the Plant Kingdom is 37” x 25” and is designed for the classification of 48 plant pictures. The chart is printed in five colors. Each color provides a visual key to the organization of the plant classification. A sensorial impression is thus utilized to give immediate help to both teacher and student in their overall understanding of the botanical master plan. The chart of the Plant Kingdom includes 48 Full-Color Original Art Pictures 2” x 2” in size. To guide the students in the classification of these plant pictures, the back of each card bears the common name of the plant represented and some basic information on the characteristics of the phylum, class or order to which the corresponding plant belongs. Again, the sensorial approach is used to aid the teacher and student in this classification. The back of each picture is printed with one of the colors used on the chart to indicate phylum (brown), class (black) or order (red).